More than 2,500 incoming freshmen are expected to attend E2 this year, and we can’t be successful without the help and support of volunteers like you! E2 helps our freshmen start their engineering adventure on the right foot. They participate in fun and engaging activities like interactive workshops, a team-building challenge course, group projects and competitions. You can be a part of that experience for our freshmen. 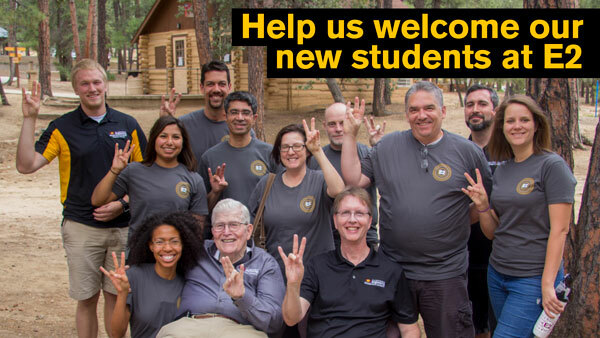 Volunteers are needed both on campus and at camp in Prescott, Arizona. Get out of the heat and head up to Prescott for a day or two! A volunteer orientation will be held later to review details of all volunteer positions.